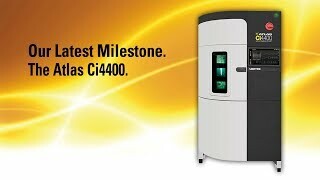 The Ci4000 Weather-Ometer, with its advanced digital control system, represents a monumental achievement in applying digital and optical technologies in an easy to use laboratory weathering instrument. The Ci4000 is approved by many OEMs in the automotive, paints and coatings, and plastics industries as the exclusive platform to deliver accurate, reproducible and repeatable results for predicting service life. The Ci4000 has been certified CE, UL, CSA, ISO and EN compliant. Key features of this instrument include: a rotating sample rack to maximize uniformity over all specimens; custom designed nozzles to provide uniform specimen and rack spray; ASTM Black Panel Thermometer or ISO/DIN Black Standard Thermometer to control and monitor temperature at specimen level to ensure test repeatability.